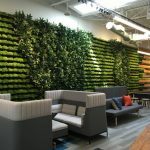 Behind the Curtain: Quid, Inc.
For the software engineers and information analysts at Quid’s San Francisco headquarters, the prevailing aesthetic is Stanley Kubrick meets Isaac Newton meets John Le Carre. Our challenge was to transform a small space in a bunker-like setting into a comfortable, light-infused office. We chose to make assets of existing conditions that might be construed as problematic. A serpentine entrance, for example, well removed from the main work area, now leads to a “space station” reception desk. A library supplements its small collection of books with a larger trompe l’oeil collection on the walls. A workspace concourse functions like the bullpen of a Fleet Street daily. The result — slightly British and lightly retro — is in keeping with the London/Oxford pedigree of the company’s founders. Translating that pedigree (and attendant business culture) into design terms was a primary goal. Intelligence informs the Quid working culture, in both the Oxford and MI-5 connotations of that word. Our finish motifs reflect both themes. In the serpentine entrance, the wallpaper graphics play on the concept of linking information in unexpected patterns. The library, with its mix of books and faux books, creates a visually arresting density in what is actually a sparsely furnished space. 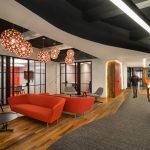 Our design emphasizes cool surfaces, indirect lighting, and graphics that speak to the inter-connectivity of data in all its forms. These eclectic elements fuse into an elegant and surprisingly playful whole.